This month, UNICEF are campaigning to raise awareness of the current food crisis in South Sudan. She is three years old. Yes, that is a tiny three years old. She’s not much more than a baby, yet she led her blind father for four hours to find a UNICEF relief centre to find food. She’s my heroine of the year. In the South Sudan, there are around 50,000 children at risk. Think about that. I know how I would feel if I were facing the prospect of not being able to put a hot meal on the table for my boys. Or actually, any meal at all. It must be devastating for the parents, the children and the whole extended families. 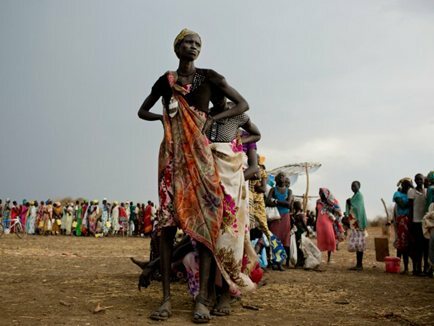 Around three million children in the South Sudan have faced need of humanitarian assistance. That’s over half of all the people who live in Scotland alone. They struggle with basic needs as a result of decades of civil war. 550,000 children have been displaced. That means they are living in the open, just as the rainy season begins. Cholera has begun to break out and parents must be at their wits end. It really brings home how lucky we are in the Western world, with our basic need for food and shelter met. The civil war has meant that South Sudan’s agriculture has not able to flourish. Crops are not being planted and food is becoming more and more scarce. I found it frightening that UNICEF reported on the possibility of 4 million people starving by the end of the year, and 50,000 children likely to die. UNICEF is in South Sudan, working to help the children with care and resources to survive. Along with their partners, they have screened more than 60,000 children against malnutrition and immunised more than 260,000 against measles. UNICEF would like to give hygiene kits and safe water for cooking and drinking, for 450,000 people. It’s an ambitious target and one that needs help to succeed. How much value do we place on our own ability to have freedom to play and find the families they have often been separated from? I don’t know how anyone can put a value on that. Feel free to give whatever you can. £8 could give an emergency water kit for a family. Just £5 could help give life-saving food for a child for a week. I am grateful for just how lucky we are as a family.